Post by Exhibitions Intern Ryan Mercado. To read more posts from JMM interns, past and present, click here. Outside of the Museum of Jewish Montreal. 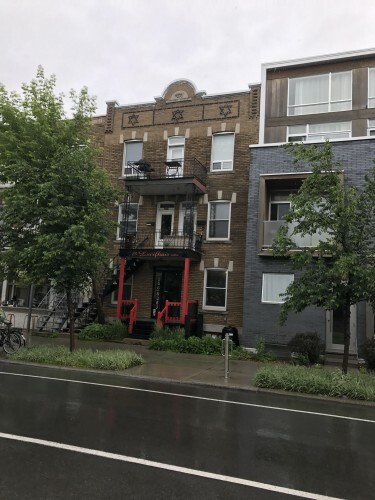 Before I started this internship at the Jewish Museum of Maryland, I scheduled a trip for late June to go to Montreal to go apartment searching to prepare me for my upcoming move to Canada for Graduate School. 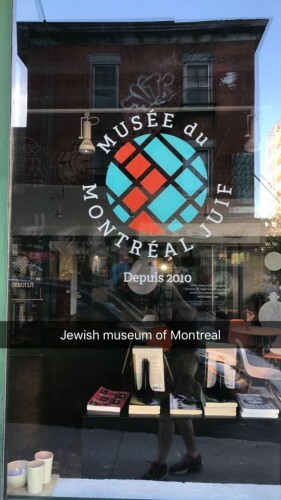 Suddenly, the idea hit me that I could use this trip as an opportunity to help the JMM connect with another Jewish Museum, The Museum of Jewish Montreal. This Museum is very new, founded in 2010 by Zev Moses, a city planner who started mapping out Jewish histories of buildings around the city. His project eventually turned into a Museum. One of the services the Museum provides are walking tours of historic Jewish Neighborhoods. I decided that while I was in Montreal I would stop by to interview Zev and also take a walking tour to learn something new. The walking tour I picked was titled “Rabbis, Writers, and Radicals” and this blog post will be about my experience on that tour. My guide on the walking tour, Trisha, showing us what an old Synagogue looked like before it was converted into a high school. The former building of the Young Men’s Hebrew Association (YMHA). It is now a mixed-use/ residential building but the old sign still remains on the façade along with two Star of Davids. Right away I saw similarities in this description. Like Baltimore, Montreal used to have a thriving Jewish Community in a central neighborhood known as “The Plateau/ Mile End.” The neighborhood teemed with newly arrived Jewish immigrants mainly from Yiddish-speaking Eastern Europe who created a truly thriving neighborhood with shops, entertainment, and cultural institutions. Eventually, the Jews of Montreal moved away to other areas of the city, or left Montreal all together. The same situation happened in Baltimore, where Jonestown and Lombard St were once the epicenter of Jewish life until the Jews left the neighborhood for areas outside the city. Already seeing similarities, I was excited to take the tour. I brought along my phone for pictures and met Trisha, my tour guide. We started at the Museum and went on our way. 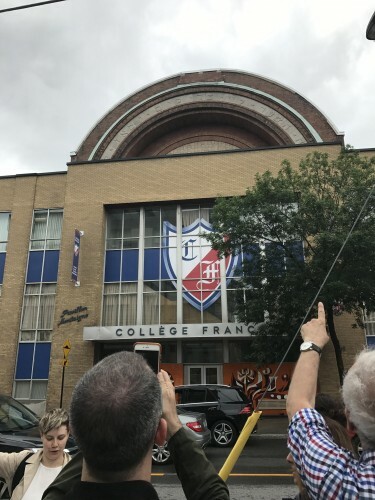 College Francais, an old synagogue that has now been converted into a high school. The old Hebrew letters are still on the top. I believe that this is the synagogue that Trisha is showing us in a previous picture. As we walked the streets of Montreal, everything looked modern with no signs of any Jewish presence. One could be excused for thinking that there was no Jewish community at all. One of the first places we stopped was a residential building that looked like an old office building. No outward signs of Jewish presence caught my eye until Trisha asked us to look up to the top of the façade. There in big letters carved into the stone was the name “Young Men’s Hebrew Association.” To me that sounds similar to the YMCA (Young Men’s Christian Association). Star of Davids also adorned the stone as well. Trisha informed us this used to be the said organization’s meeting place, as well as the location of facilities Montreal Jews used such as a swimming pool. I was amazed that such a normal looking building had such an interesting past. And yet, I never noticed until I looked up and read the sign. I assume the majority of people haven’t noticed the sign as it is high up and a little difficult to read. This was the first taste of what I would see on the rest of the tour. The Evangelical Pentecostal Church that used to be Beth Hakneseth Anshei Ukraine, an Orthodox Synagogue. The building has many similar architectural features of a Synagogue. Behind the cross is an outline of a Star of David. Another stop on our tour was to a local high school, now turned into a youth centre. Trisha explained that back in the day, the school had a 90% Jewish population and then showed us photos of some prominent alumni. One would have never guessed that a school in the middle of Christian-majority Quebec would have an enormously high Jewish population. An orphanage for Jewish Children and then a house of a Jewish radical were next on our list. At each stop. Trisha explained to us the context and history, as well as used visual pictures she had in her binder and even music to enhance the experience. Finally, towards the end of the tour, one last stop really struck me. The cornerstone of Beth Hakneseth Anshei Ukraine. It is in Yiddish and is one of the only visible symbols on the building that signify its Jewish past. The Yiddish says something along the lines about women helping to build the building and congregation. A large brick building stood before me. Over the door a sign read, “Evangelical Pentecostal Church.” A crucifix also adorned a large window as well. To me, it seemed like just another christian church, but then Trisha told us to look closely at the crucifix window. I looked closely and behind the cross was a Star of David outline! I was amazed and shocked at the same time. 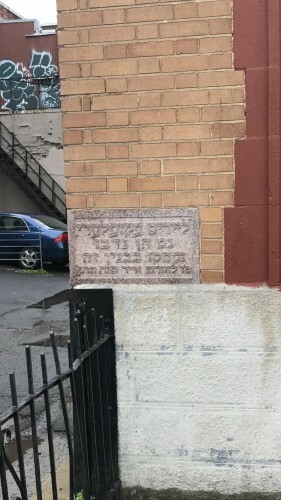 Trisha then pointed to the left corner of the building where a cornerstone was with Yiddish writing that told of women builders who helped build the congregation. What I was in front of was the old building of Beth Hakneseth Anshei Ukraine, an old Orthodox synagogue which was sold to the Christians who converted it into a Church. However, its Jewish character still remained. The Star of David outline behind the cross and the Yiddish writing on the cornerstone revealed to me the striking past of the building, as well as a symbol for Jewish migration and assimilation of their buildings. 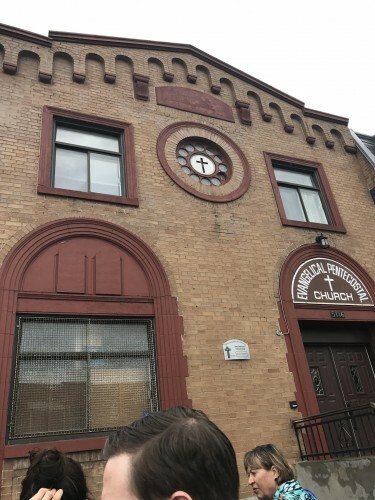 This congregation’s story is all too similar to many historic synagogues that once were in the Mile End Neighborhood. It thrived for a time, was a central meeting place for its congregation, and then moved away to another area. With the Jews gone, Christians came in, bought the building, and renovated it to be a Christian church. 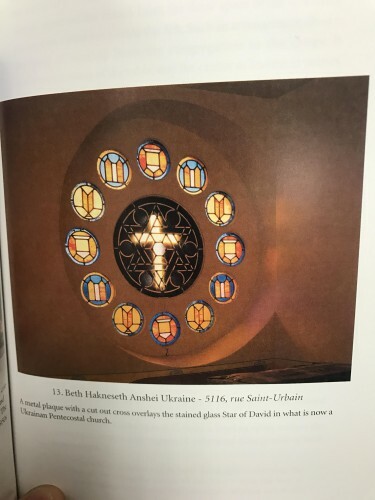 This really connected with me, as I had spent my last year in college learning about how former Jewish communities and buildings in the Middle Ages were taken over by Christians and appropriated into Christian houses of worship. The Montreal Synagogue I was looking at was a modern example of my studies coming full circle. It was both incredibly interesting yet sad. Inside of Beth Hakneseth Anshei Ukraine. You can see the Star of David outline with the cross facing the outside and covering it. Source: Taube, Sara Ferdman. Traces of the Past: Montreal’s Early Synagogues. Montreal, QC. Vehicule Press: 2011. Located in photo portfolio between pages 96 and 97. The tour ended at a historic sandwich shop, much like our very own Attman’s. I got a bite to eat and then walked back to the Museum. As I was walking I realized that Montreal’s Jewish presence was all over, but required a keen eye to notice it. I passed a hairdresser shop that had Stars of David brick designs on the top of the building. 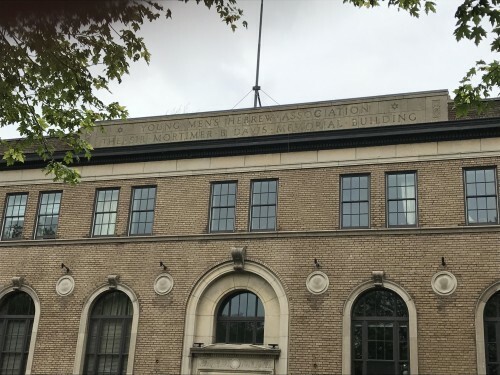 It reminded me of the other buildings I saw on the tour, such as other buildings that had been re-appropriated into mixed-use buildings such as a high school, daycare, and even just apartment buildings that still had traceable Jewish symbol on them like Hebrew letters or Stars of David. There are massive Jewish influences on all these buildings and I doubt anyone knows about them or why they’re there. Thankfully, the Museum of Jewish Montreal will shed light on these buildings. One may ask why there is a need for Museums, especially Jewish heritage museums. If you’re in a large city or a historic neighborhood, look around you at your surroundings, perhaps you’ll see Hebrew letters or Star of Davids on buildings, or maybe something that looks Jewish and wonder why they’re there. That is why we need Jewish Museums, to uncover and preserve the past to something as small as a deli sandwich to an Synagogue turned into a church. 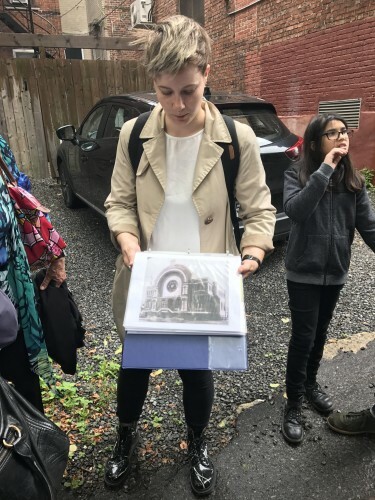 Montreal’s new Jewish Museum will and is certainly fulfilling that important mission by helping the general public connect to history through exciting walking tours and other programs. A hairdresser shop and apartment building in Montreal. It has noticeable Jewish Stars on its façade, yet it is not a synagogue nor does it have anything to do with the modern Jewish Community. This is an example of a property that was formally Jewish but is now in mixed-use. A very similar sight in Montreal’s historic Mile End neighborhood.